Surrounded by a vast ocean and a wide horizon, Imani Wilmot stands alone on her surfboard, gliding and cutting through waves. She does it in the most mesmerising way, like the most talented athletes making their perfected routines look effortless and cool. 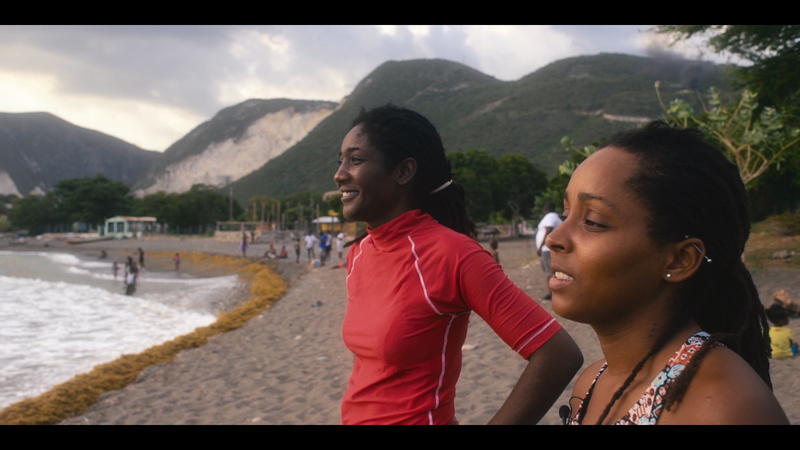 Rather than using the sport as a physical challenge to push herself, to chase the biggest waves she can find, or compete in, Imani surfs to “get pause”, to question how she’s going to improve her day, herself, and make things better for the women around her in Eight Mile, Jamaica. 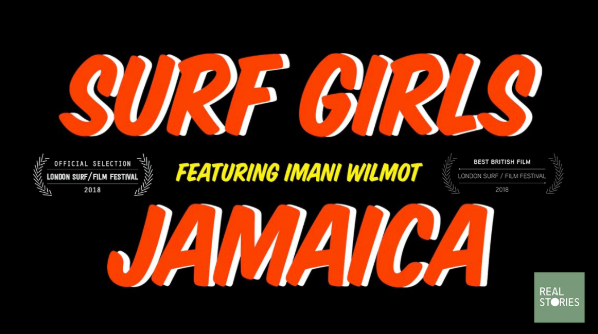 Imani has founded the first surfing camp for women on the island, the focus of Joya Berrow and Lucy Jane’s short documentary Surf Girls Jamaica (SGJ) which recently won Best British Film at the London Surf / Film Festival. I have never really considered trying surfing, and until I watched SGJ I put this down to being lazy and unable to swim. But watching the documentary, I realised there had been a glaring absence of women of colour (WoC) in the images I’d seen of surfing. Never seeing another black woman surf in any of the media I consumed fuelled my disinterest. Joya explains that the intention of the film was to show WoC “that there is a place for them in surfing, to realise there is a global movement of diverse surfers”. Seeing the command and control that the girls at the camp had whilst surfing certainly makes it a lot more inspiring and appealing. The ubiquitous image of a surfer in mainstream pop-culture seems to be of a white person, blonde hair in “beachy waves”, in somewhere like California, living the freewheeling lifestyle that’s presented hand in hand with the sport. Whenever anyone mentions it my brain usually autoplays this video on loop until the subject changes. Which is absurd when you consider the sheer amount of women of colour who live by the coast globally and the fact that surfing originates in Hawaii. 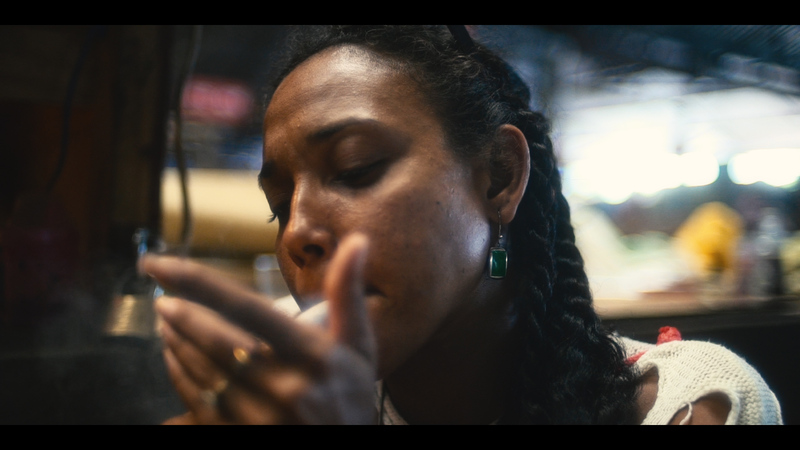 Joya and Lucy found inspiration for the documentary while filming in Colombia three years ago and seeing the disparity between surf media and the big surf community out there. “You hear about waves in the Caribbean, but can’t see or hear the stories of the people who are actually part of the communities,” they said. There is a global lack of representation of WoC in the surfing community and the pair attribute this to a combination of discrimination, and people being happy in their own little circles. The sport is so escapist by nature that they can remain wilfully unaware of its exclusivity. They hope SGJ will show everyone in the surf industry and community how to and why they should help others get into surfing, and get them to consider how the sport can be made more accessible to others. The closest to water a typical self-care guide advises to get is drinking two litres a day or having a bath when you’re stressed – not to pick up a surfboard and catch a wave. Though the healing power of water is undeniable, the sense of calm in the sea can be felt throughout the documentary. Joya and Lucy describe to me the impact of “being out in the ocean and finding the horizon, finding space is such an escape, and having people there to listen and share that experience with”. This sentiment is reiterated and shared by Imani and the other girls at the camp. 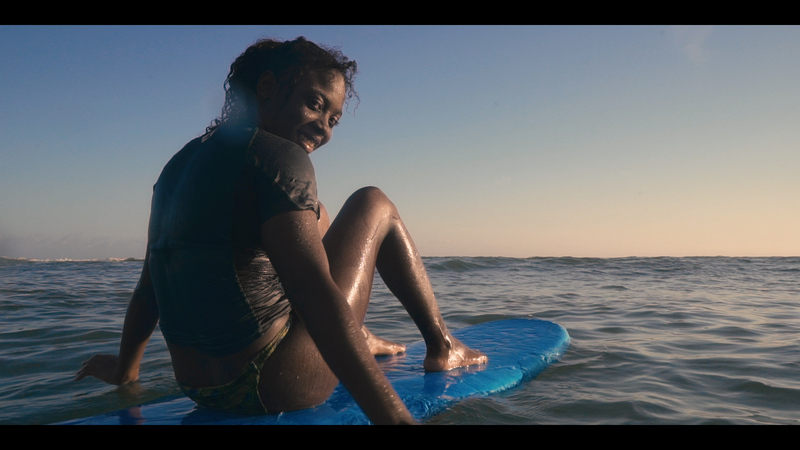 Imani, Mel Fearon and Terry-Ann Lynch are three girls featured in the film, part of the surf camp, who testify to the transformative effect surfing has had on their lives and how the water is a place for healing. They speak candidly about their experiences of sexual assault and how being a part of the surf camp has given them a space to get perspective, build a community, emotionally support and respect each other, and learn about deeper self-love. The power of black women claiming a narrative, speaking about and pushing stories many have chosen to ignore has proven important time and time again. The internet and social media has given many a platform and democratised space to discuss systems of oppression, and freely express their own identities. Documentary cinema has a murky and unethical history when it comes to the representation of people of colour. For instance, the first “documentary” by Robert Grierson Nanook of the North was a largely staged, colonialist imagining of Inuit culture. Joya and Lucy told me how they worked very closely with Imani and the girls at the camp: “Imani is actually a filmmaker herself, the film is very much a collaboration with her, it was the three of us collaborating to tell the most impactful story that we could.”. SGJ is clearly a story made by and for black women. It not only tells their stories, but presents a solution; the surf camp is so much more than a place to learn, but a safe space to grow, support friends, and get that sense of escape. When considering the massive gender discrepancy and discrimination in the sports world in general, it is clear why surfing camps like Imani’s are so special and important. She is using what she loves to broaden the horizons for those around her, she “didn’t need a big crowd to make a difference”. Watching Terry, Mel, and the other girls glide through the waves, their approach to surfing as something fun, something supportive, rather than for gnarly tricks and bragging rights, presents a point of accessibility for women of colour and others to get into the sport.